We’ve all felt the frustration of seeing things in our spaces which shouldn’t be there. Potholes, fly dumps, broken signage and streetlights, bad or nonexistent pedestrian walkways and crossings, and even rubbish bins in weird, not-useful places. Yes, council websites have contact details on their websites, and one can email, call it in or, if they’re on social media (and actually using it), pop them a tweet or Facebook post. But this isn’t always convenient, and it doesn’t lend itself to developing an open, publicly-accessible record of issues and their resolutions. People calling in issues is also _far_ more expensive for councils (think call centre staff, time, etc), which are under increasing budgetary pressure. Enter FixMyStreet. The service has been around since 2007, and has been hugely successful overseas. Essentially, one reports an issue and its location, and the site automatically sends it through to the relevant council authorities. There’s also a New Zealand version, built by local dev and#opendata advocate Jonathan Hunt (otherwise known as @kayakr). It’s a great example of civic tech. Screenshot from fixmystreet.org.nz, taken on 20 June 2016.
the extent to which people in NZ were using the service. So, I built a map. I scraped the overview table in http://fixmystreet.org.nz/reports, and then set about cleaning up the data. The main bit which, yes, I ended up doing manually so I could get the precision I wanted, was getting all the markers properly geolocated. For this, I looked up the physical office address of each of the 67 district and city councils’ in the list, and then geocoded those. After this, I generated a bubble chart, which you can see, for new issues, fixed new issues, older issues and fixed older issues. What you see below is the result, and is exactly why I love data visualisation so much. 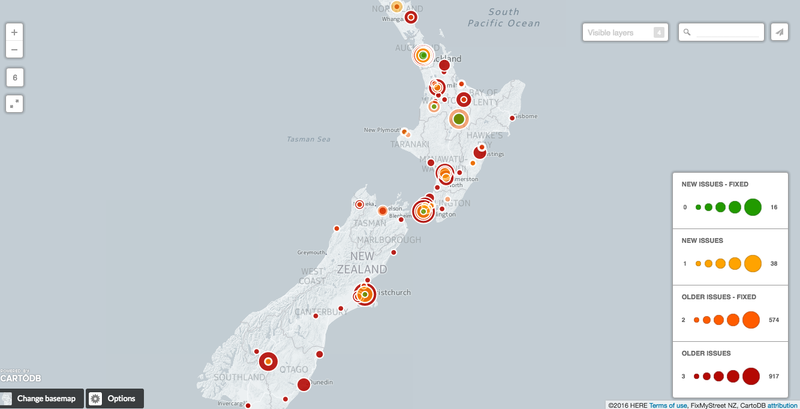 Popping everything onto a map gives one an immediate, intuitive understanding of what’s going on throughout NZ. An snapshot overview of FixMyStreet NZ issues, from 20 June 2016. Head over to https://aimeew.cartodb.com/viz/a254f66a-3693-11e6-bfbb-0ea31932ec1d/public_map to play with the actual map. Credit: aimee whitcroft 2016, using data from fixmystreet.org.nz/reports. If you’re wondering why there are a number of councils missing, it’s because the map’s been set not to show any 0 values. So in cases where a council has had nothing reported nor fixed, it doesn’t display. The other possibility is that the council wasn’t on the FixMyStreet site at all, which I reckon counts as a very solid “nothing reported nor fixed”. Taupo has a pretty active user base, and it looks like the council’s been very responsive! Less so councils like Wellington and Christchurch, where there’s a relatively active user base but less than a quarter of the reported issues have been fixed (or reported as fixed, at least). And then there are the councils with an inactive or nonexistent user base, or councils which aren’t reporting fixing any (or very few) or the issues reported. I know that the site sends automated emails to councils, so I can’t help but wonder: are councils not fixing these issues, or are they simply not reporting them as fixed? Both cases will, over time, dissuade people from using FixMyStreet, and potentially from trying to engage with council. These days, with councils increasingly wanting to be seen to be actively working on improving engagement, this seems like a Bad Thing. The flip side is, of course — why aren’t people reporting issues using FixMyStreet? Is it because they don’t know about the services, or is it because they see a council which isn’t reporting issues as fixed, and so they stop bothering? Are there other reasons? encouraging people to use services like FixMyStreet to report any and all issues they come across. It’s not complaining, or telling on people, or being negative. Quite the opposite! It’s about taking active pride in one’s places and spaces, and wanting them to be the best they can be for you and everyone around you. Services like FixMyStreet also benefit from network effects — the more people using it, the better it can become. getting councils to improve their response rate to issues. This is also a rich source of data for councils on what people are finding problematic, potential areas for improvement, and it’s a great way to show _everyone_ that they’re actively and positively engaging with the public. Given the relative dearth of actual local government performance KPIs and data in New Zealand*, I’m going to be keeping a close eye on how my council is doing on FixMyStreet. Disclaimer: of course, this is just an overview. It would certainly be fascinating to dive in a little, and look at what sorts of issues people are reporting, which issues get fixed and how long it takes, and so on. I’d love to see what other people are generating with this sort of thing, or hear your ideas on what analyses you’d like to see!